Bangkok is known as one of the top budget-friendly cities. However, we’ve seen countless travelers take it that just because they have a limited budget, the most they can do is ‘sight see’ the famous and free attraction sites in Bangkok. As your local friend, it bothers us to see you miss all the cheap, fun and unusual things to do in Bangkok. So here is our 2019 list of budget-friendly and unusual activities you can actually spend quality time doing while in Bangkok. Thong lor pier (at the end of the posh street) and more. Cost: around 10-20 baht, depending on the distance. 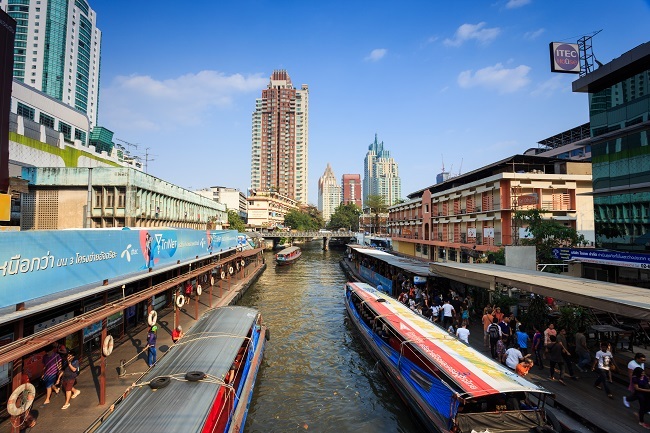 Get to know the real Bangkok canal (klong) – ride the local boat along Saen Saep! We are quite certain that you’ve heard of BACC, or even walked past the playful white building opposite MBK Center before. What you probably didn’t know, though, is that besides many art exhibitions by both Thai and international artists, BACC is home to a very delicious homemade ice-cream shop – Icedea. Mango Sticky Rice ice cream and Kao Tom Mud Ice cream (Sweet sticky rice with banana fillings – a traditional Thai dessert) are among Icedea’s claims to fame. Tips: Icedea is right before the escalator on the 4th floor of BACC. Cost: 1 quality scoop costs 59 baht. But it’ll be tricky to single one out, we love all the flavors! If you are an antique arts buff, this might be the place. This serene house-turned-museum belonged to an American man who pioneered the Thai silk industry shortly after WWII. You will find Asian art pieces and learn about Thai living. Plus, the house itself is a true beauty – a traditional Thai house. The cafe next door in the same compound also offers relaxing atmosphere and serves great food. Tips: Jim Thompson House is open daily from 9 a.m. – 6 p.m. Cost: 100 baht if you are under 22 years old (Passport required). 200 baht if you are older than that. We know you have had ample information about temples with free admission fee. Or you might simply start getting temple sick after a few days in Bangkok – and we totally understand you. But hear us out, because this David Beckham Temple doesn’t even feel like your typical Buddhist temple. For a start, it got the quirky nickname because of its gold statue of the football star on the altar. The outside of the main hall is teeming with your favorite childhood cartoon characters, from Pikachu, Pinocchio, Dobby the house elf, Mickey Mouse and countless fun imaginary creatures. The fun part is trying to spot them all as there are so many! Tips: Wat Pariwat is open until 10 p.m. – so it is up to you to meet your imaginary creatures in during daytime or under the moonlight, we bet they shine differently. Just take BRT bus from Chong Nonsi BTS station. The bus costs 15 baht. Cost: There is no entrance fee for Wat Pariwat. You might have walked past this retro building in Siam Square area multiple times before. A short walk up the stairs will take you to Bangkok’s only remaining standalone cinema. Established since 1969, Scala is that dear old friend of family who was there since your mom broke up with her ex and met your dad. Today Scala’s single screen shows alternative Thai movie, and occasionally all-time classics such as Children of the Paradise (as of December 2018). Tips: check the cinema’s program here. Cost: Tickets cost 120, 140, 160 baht. When it comes to cheap and unusual activity to do in Bangkok, nothing fits more perfectly to the criteria than Siriraj Medical Museum. Warning alert: if you have an aversion to blood and dead bodies, you might want to steer clear of the place. There are two main museums that display several body parts, stillborn infant bodies and mummified bodies of Thai serial murderers in glass cases. For those in medical field, the museum is obviously a trove of gem. To us, the place never gets old because it kickstarts again that classic childhood wonder about how we came into this world and how truly incredible it is that we manage to grow into a full-size responsible adult. Tips: It is best to visit Siriraj Medical Museum on weekdays, as certain parts of the museum are closed on weekends. The museum is open daily from 10 a.m. – 5 p.m. except on Tuesdays and public holidays. Cost: Entrance fee costs 200 THB for 1 museum, and 300 THB for both museums. We all see noodles and made-to-order food stalls at every nook and cranny of Bangkok. Still, it can be a challenge to find delicious and cheap street food varieties, such as braised pork or roasted duck. This is where Charoen Krung neighborhood comes to our rescue. This Thai-Chinese-Indian community is teeming with locals’ go-to restaurants that have been here since our parents were kids. Besides the food, the area never stops casting its spell on us. The retro buildings are charming, and the bustling vibes between local food sellers and shoppers still feel somewhat authentic. Tips: Go there for breakfast or dinner (the food stalls start closing around 6 p.m.) Get off at Saphan Taksin station and simply browse the main road. There is a market in front of Robinson Department Store, as well as countless other food stalls and restaurants on both sides of the road. Got Muay Thai fights at a stadium on your to-do list, but find the 2000 baht ringside ticket unhealthy for your dear wallet? We got you an alternative at Channel 7 Studio. Muay Thai fights start here after 2 p.m. on Sundays. Mind you, the benches are known to be stiff, the air hot and humid, and the whole place simply packed with shouting local fans and gamblers. Still, you are sure to get a one-of-a-kind experience of the global craze, at its country of origin and among its local Muay Thai connoisseurs. Although Bangkok has a handful of floating markets worth visiting, we say Taling Chan floating market is cheap and unusual. This is where we go to shop and scout for food on productive weekends (yes, we deem a food hunting day productive.) Don’t expect to find a lot of chic handmade souvenirs here though, as you’ll most likely find rare Thai main dishes and desserts, noodle stalls on floating rafts, as well as some small house plants. The food is freshly made and cheap, and the sellers are friendly. Tips: Taling chan floating market is open on weekends only. Get there by a cab, or get off at Saphan Taksin BTS station, take a boat to Wang Lang Pier, and hail a cab.